What can we learn from LD50 values? Describe the trends seen here Looking at oral MALE vs FEMALE mouse, we see there is a larger variability in the female mouse's response... This might mean there is interaction with estrogen (Oxidative stress is influenced by an animal’s estrogen level-- which means that antioxidant therapy might be able to help since the females tolerated it slightly better and there was more variation depending on their cycle. Vit E repairs cell membrane and selenium inc cellular antioxidant defense). Then if you compare The ORAL versus the IP mice, you see that it takes a much LOWER dose for the IP route to be lethal- meaning the drug has poor oral bioavailability comparatively. Then you can compare the MOUSE IP to the RAT, and the species difference in LD50 means there is a difference in phase II biotransformation (mice have a stronger phase II biotransformation so tolerate better than rats- aka mice need higher dose needed to kill a mouse bc of more phase II biotransformation in mouse). Hamster needs a WAY WAY higher dose than mouse or rat to kill it- must have the best/most optimum phase II biotransformation. what is MRL/ how do we determine it/ why do we need it Max residue level- use this to determine a withdrawal time (a recommendation). It is almost identical to the ADI (acceptable daily intake) calculation but includes the food factor-- which is obv how much we eat. Its established in the high consumer. Adjustment for interspecies differences--> explain how we determine what is good for people from ANIMAL studies, and when how it is good for people when people are all so different This uncertainty is covered by the Composite uncertainty factor (CUF 100)... we get the 100 from 10 times 10, where the first ten is a factor of interspecies differences, and the other ten is Inter-individual differences. We got these numbers (10s) from toxicodynamic and toxicokinetic studies/factors. What is the true risk of drug residues?--> Substances that do not meet these criteria can not be licensed for use in (food producing) animals (3 situations) (1) VMPs (vet. medicinal product) are not licensed if they induce chronic (or non-linear) dose-dependent effects (carcinogenicity) (2) Pesticides are tested by the same criteria (and more tests on environmental toxicology and tolerance levels are established: see vegetables) (3) Natural toxins generally do not meet these criteria! (thing in kirks review, idk) what should we remember about the UF? 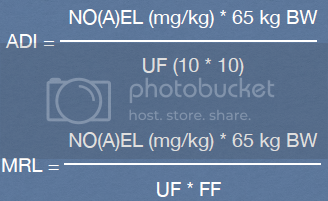 UF= Uncertain CUMULATIVE???? **** <--doesn't make sense but remember this!